Reef Thrill Campaign takes Mr Green players back in time to break the free spins code by playing a game called Turn Your Fortune. Your goal is to grab the placement at the score table to get your share of the pot being dealt. 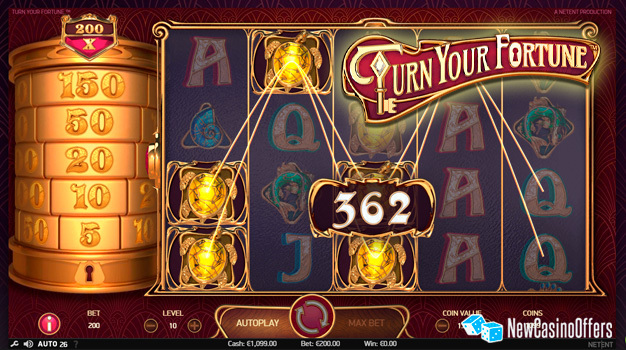 Turn Your Fortune is a gold-plated five-reel, 4-line, and 20 payline slot game, where player tries to collect winning combinations using the ornamental animal symbols. Reef Thrill will be played between 21 January and 23 January, where players will be rewarded with free spins and plenty of fun.You can find Turn Your Fortune at the Mr Green’s game selection. The new players will also receive 200 free spins as well as a 100% deposit bonus when joining at Mr Green’s. Participation is truly worthwhile, because the Thrill Reef campaign is also open to play with the bonus money. Turn Your Fortune introduces the player into a beautiful and well-functioning gaming entity with good winnings. With its basic functionality, the game is a traditional online slot game, but it includes special features that bring a tremendous boost to the game. The game includes free spins, scatter symbols and a special Fortune Wins bonus game that can be considered a highlight of the game. During the Turn Your Fortune bonus game, the main prize may rise up to 400 000 euros. During the bonus game, the main prize may rise up to 400 000 euros. So there is also a great variance in the game. You can also try the Turn Your Fortune game for free at Mr Green’s online casino, so join now.